The global refugee crisis has reignited long-standing debates about how to successfully integrate religious minorities into liberal democratic societies. 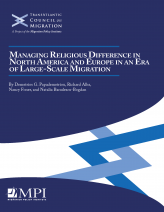 There are fundamental differences between Europe and North America in how religious difference is managed. In Western Europe, cultural fears continue to dominate, with many seeing Islam as a direct threat to the norms and values that bind their societies together. In contrast, security fears, particularly surrounding terrorism, are predominant in the United States. This Transatlantic Council on Migration policy brief focuses on the different policy frameworks and practices governing Muslim integration in North America and Europe, to offer a window into how receiving governments and societies manage fundamental change in an era of large-scale, and at times massive, immigration. As Muslim minorities continue to grow in size and influence—particularly in light of unprecedented flows to Europe—governments face the critical challenge of creating a narrative about immigration that embraces religious difference and builds rather than detracts from community cohesion. The brief concludes with recommendations on ways governments can manage immigration more effectively, turning the influx of culturally different newcomers from a challenge into an opportunity. II. Religious Difference: Vehicle for Integration or Threat to Social Cohesion? B. The United States and Islam: Building Bridges? III. Immigrant Integration in an Era of Rapid Change: What are the Ingredients of Success?